The house: Front deck/porch leads to kitchen; 2 Br on 2nd floor. Sunroom with wraparound views; comfy Queen futon couch, DirectTV. The octagonal master bedroom with wraparound wooded view. Master bathroom/dressing area leading to master bedroom. Bedroom #1 with wraparound views, balcony, twin beds. Bedroom #2, balcony, twin beds, DirectTV/DVD player. Bathroom for bedrooms 1 & 2, skylight over tub/shower. The back of the house as seen from master bedroom balcony. The back deck with Adirondack chairs. Beds: 1 queen, 4 twins, Very comfortable fold-out couch. Beach: Long Point Beach ~2 miles. Sipiessa, 1.5 miles. This sun-drenched architect’s dream home is nestled among five wooded acres close to the Tisbury Great Pond. The 900 sq. ft living/dining room boasts 19’ ceilings with skylights, a suspended walkway leading to the master bedroom wing, a grand piano and a massive stone fireplace. Four bedrooms and three full baths, provide sleeping for 8 people. The gourmet eat-in kitchen has a 6-burner Garland stove, refrigerator with ice maker, dishwasher, and appliances and cookware to satisfy the most discerning chef. Enjoy the sunshine with our front and back decks, covered porch, 2 outdoor dining tables, herb garden, gas grill and outdoor shower. We provide a trustee’s pass to beautiful Long Point Beach, a 15 minute drive from the house. The house has high speed internet, 3 DirecTV sets, and a washer/dryer. You can also paddle our canoe (paddles and life jackets provided) to beautiful Long Point beach and pond (when water levels allow), or walk or bike (several bicycles are included) along a 1.5 mile woodland trail to Sipiessa, a small quiet beach on Tisbury Great Pond. Beach towels, chairs, and other supplies are provided. We are also only a half-mile away from the State Forest bike /running path which has a great 12-mile loop; and 3 miles from the West Tisbury town center. The house is off of a 1/2 mile improved dirt road: high-clearance vehicles are suggested (or please drive slowly). Nearest beach: Long Point Beach ~2 miles. Sipiessa, 1.5 miles. The house is accessible to people using walkers or canes. 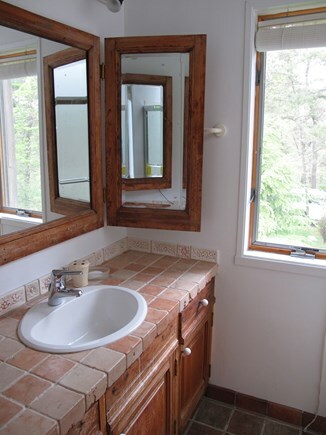 There is a comfortable sleep sofa in the sunroom and a full bathroom on the first floor (with tub/shower). Long Point Beach is accessible for people with mobility issues. We are a Boston family of four (kids are 11 & 16) with the good fortune to stay at this house for the first time in August 2016, and we will be returning this August as well. We are long time MV summer renters, and this is by far the best property we have ever stayed at on the island,. Truly a home. The architecture is unique, memorable, and conducive to both relaxing and having fun. The kitchen is incredibly well equipped, from the ice-making refrigerator to the truly restaurant-level gas stove with salamander broiler, to all the pots, pats, dishes, and utensils you could ever need. Multiple decks, an outdoor shower, two outdoor dining tables, an herb garden, and large lawn compliment the high-ceilinged great room with fireplace and grand piano. Bedrooms are smaller in scale compared to the common areas, but are plenty big and boast lots of light from multiple windows and sliding doors. Master bedroom with octagonal layout (like much of the house) is unique with sweeping views of the surrounding land, and a great rain shower in the private bath. Perfect location, just off the main road and minutes to Longpoint, our favorite beach on the island, and very close to Alley's/farmer's market/artisan fair area. Pretty quick to Morning Glory as well. Owners are responsive and responsible and easy to work with. My family has spent time at this house each summer for many years. Without a doubt, our time there is the highlight of our year. 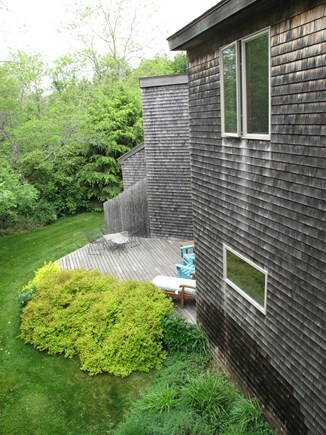 The house is absolutely spectacular - incredibly unique, modern architecture, beautifully and comfortably furnished and appointed with everything you need for your stay on the Vineyard. Tons of natural light, glass doors and windows throughout. Beautiful hardware floors. Incredible, expansive landscaping and outdoor furnishings make this house an incredible place to stay. Huge kitchen with everything you need to create amazing meals. Beautiful working fireplace. The house is perfectly secluded but ideally located at the same time. We've stayed at this wonderful home for over 6 years now. 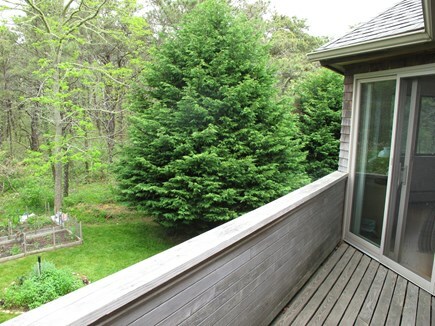 It boasts wonderful privacy and incrdible convenience to the bike path, ocean, Tisbury library and town center. We thoroughly enjoy our daily paddles on Tisbury Great Pond, and running along the quiet roads to the beach for a quiet morning sun salutation makes this spot idyllic. We cannot recommend this home away from home enough! We've been renting this amazing house for the past six or so years, for three weeks each time. As long time renters on the Vineyard, the Cape, Nantucket, Maine, and northern California, this is easily the best of all (why else would we keep returning?). The pictures cannot do the house justice (we keep trying ourselves). It's not only distinguished architecturally, but the light is astonishing. It's as private as one could wish, on the part of the Vineyard that we think the best, and there's water access within two minutes walk, with kayaks, and a direct route to the ocean. (Not to mention the most incredible beach on the island, Long Point) And here's the big secret: it's very reasonably priced. Compared to more ordinary homes, none of them with this kind of property or privacy, which charge way more, this is a great deal. Very well equipped and immaculate. Three main decks, so you get to choose the right time of day for the right light and/or shade, AND a roof deck (perfect for drinks and appetizers before dinner). Our family have been seasonal residents on Martha's Vineyard for more than 30 years. This house was designed by our father, Lee, who was famous for his sense of humor and his op-eds in the Vineyard Gazette. We love this house for so many reasons. The main living room has so many windows and skylights that you almost don't need to go outside. It's elegant and very comfortable at the same time. It's decorated with art from the family's travels around the world, as well as original art by the architect and his daughter. The house is down a half-mile dirt road, and up against a finger of the Tisbury Great Pond, so it feels very secluded. We're only a couple of miles away from West Tisbury, which has the Saturday farmer's market and the beautiful library with its great fiction, DVD, cookbook, and childrens section. (If you have a CLAMS card you can check books and DVDs out.) We're a 1/2 mile bike ride to the State Forest bike path, a 15 minute drive from the airport, and a short drive away from State Road restaurants and shops. Most importantly, we are only 15 minutes from beautiful Long Point beach, which is our favorite beach on the Island, in part due to the swimming beach at the Pond, which is great for kids.